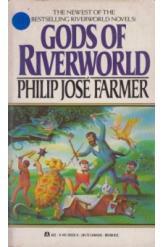 Gods of Riverworld Philip Jose Farmer Scifi. Book is in good condition, all pages intact. The sequel to "The Magic Labyrinth." Every human from throughout history, and many fictional characters, have been brought to the banks of a mysterious river. A band of adventurers seek out the creators of this bizarre world in hope of an explanation.